Chad Ochocinco promised a big game in today’s opener, and even Tweeted out his plans to fire one of the muskets held by the minutemen if he scored a touchdown. 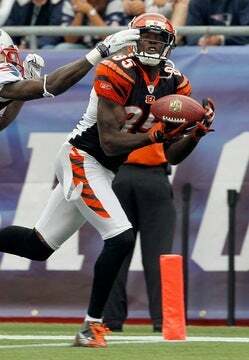 Ochocinco had his big game (12 catches, 159 yards), and got his touchdown, but there was not celebration afterward. Not with Cincinnati still trailing at that point, 31-17. What Ochocinco did do, though, on the way off the field at game’s end was shake hands with each of the minutemen. He wanted to make sure they knew that he was only trying to have a good time with it. Ochocinco added he had “no idea” why the Bengals struggled early in the game before turning things around in the second half. But he did say it wasn’t because of any confusion over what the Patriots were throwing at them.